Let's Go Green and Save Money…at the same time!!! IT IS TAX TIME, ALOT OF PRINTING AND COPYING GOING ON…RECYCLE!!! We are your solution store for cartridges, equipment sales, repair, office supplies, business services, and recycling located in the Camp Creek Market Place shopping center off I-285 exit 2, less than 10 minutes from downtown and 5 minutes from the airport. Our store policy is “to delight our customers with low prices, high quality products, and exceptional customer service, so that they become lifelong customers”. Order Online with Free Shipping on Orders over $45. View our demo. Designed, engineered and manufactured in our North American ISO 9001:2008–certified facilities, the remanufactured products are guaranteed to meet or exceed OEM performance while reducing landfill waste. ISO certification ensures that the processes that develop the product are documented and performed in a quality manner. Our goal is complete customer satisfaction. If our products fail to meet your expectations in any way, please contact us for a replacement or credit. We have programs for local community organizations, schools, and churches to raise funds by paying for ink jet and laser toner cartridges that we can remanufacture and reuse and e-waste fundraisers. Our recycling fundraiser program is simple and requires very little work. We gladly accept batteries, cables (computers and printers), calculators, cameras, computers, cell phones, CDs, copiers, copier cartridges, digital cameras, diskettes, DVDs, fax machines, fax machine cartridges, GPS devices, inkjet printer cartridges, ipods, keyboards, laptops, laser printer cartridges, mice, monitors, packaged software, PDAs, postage machines cartridges, printers, telephone, TVs, video games & consoles. Drop of electronics recycling is free of charge except large screen TVs 32″ and 48″ and old computer monitors which are $15. 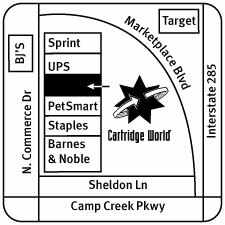 Cartridge World Camp Creek is a cartridge retailer and manufacturer with a franchise in Cascade. The company sells black and color ink printer cartridges and toner. Remanufacturing and refilling services are also available. Products: Inkjet and Laser Toner Cartridges, PC’s and Printers sales and repair, paper, fax, copy, lamination, and notary services. What makes this community special? : The Cascade community has been active in building a community by engaging the government and private sector to insure that we have the best quality of life and services. What’s the most overlooked, must-have office item? : PC and Printer sales and repair services. We have free business delivery and we can ship to customers anywhere in the United States. Order online and we will ship to you. E-waste recycling services.